Product #1217 | SKU C26-1231-221 | 0.0 (no ratings yet) Thanks for your rating! A unique medium telephoto designed for close-up shooting, the EF 180mm f/3.5L Macro USM from Canon is an L-series prime well-suited for high detail shooting with a comfortable working distance. For macro applications, this lens affords a life-size, 1:1 maximum magnification along with a 48.8 cm minimum focusing distance, however its long focal length is also ideal for portraiture and other closely cropped mid-length shooting needs. In regard to its optical design, three ultra-low dispersion elements are used to control colour fringing and chromatic aberrations and a Super Spectra coating has been applied to reduce flare and ghosting. Benefitting these assets is an internal floating focusing system that works to maintain image quality throughout the entire focus range. An Ultrasonic Motor is used to provide quick and quiet autofocus performance, along with full-time manual focus, and a Focus Limiter function also helps to ensure fast focus speeds. Additionally, this lens is weather-sealed for use in trying environmental conditions and it has a removable rotating tripod collar to benefit working atop a tripod or monopod. Medium-length telephoto prime is designed for full-frame Canon EF-mount DSLRs, however can also be used with APS-C models where it provides a 288mm equivalent focal length. 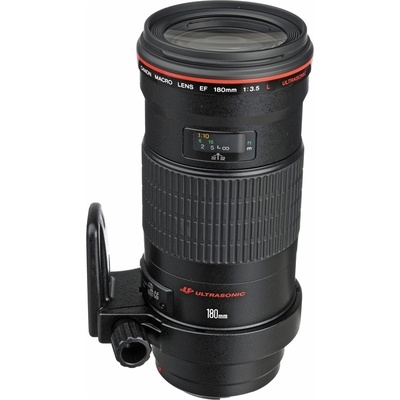 Ideal for macro shooting, this lens offers a life-size 1:1 maximum magnification along with a minimum focusing distance of 48.7 cm to suit working with close-up subjects. Three ultra-low dispersion (UD) elements greatly reduce chromatic aberrations and colour fringing for improved clarity and colour accuracy. Floating elements system along with an internal focusing design helps to maintain consistent image quality throughout the focusing range. Focus Limiter switch lets you constrain the focusing to two different ranges for faster focusing performance: 48.8 cm-infinity and 1.5 m -infinity.